One of summer's favorite sons returns this week with another action movie to serve up to theater crowds, hoping that we haven't hit our fatigue level for this kind of thing yet this summer. Although it leads the weekend, I, Robot comes in without an overwhelming level of supporting buzz and will need to win over audiences quickly. It wasn't too long ago that Will Smith ruled the summer, after films like Independence Day and Men in Black set multiple box office records. Unless you're Tom Hanks or Harrison Ford, though, it does not take many stinkers to tear that kind of status to bits (and even then). In Smith's case, it really only took one: Wild Wild West. The mean-spirited and just plain misguided adaptation of the '60s TV Western was the unquestioned bomb of the summer of 1999. With a gigantic production budget of upwards of $150 million, it may have managed to lose a ton of money and not in the phony studio accountant way. Suddenly we'd all gotten a little bit tired of Will's antics. In reality, we were just waiting for him to pick a good script again. While the cynics of the world (including yours truly) are quick to attack the soft pink underbellies of vulnerable celebrities, the truth of the matter is that most people still very much like their stars, even after a bomb or two (as the People's Choice Awards prove). An Oscar nomination and two sequels later and we're basically ready to forgive him. Teaming up with director Alex Proyas (The Crow, Dark City) isn't a terrible idea either. I, Robot is a film "suggested by" Isaac Asimov's series of science-fiction stories, which is probably sending a certain group of nerds into apoplexy, specifically around the issues of his Three Laws of Robotics (an entirely overrated and misunderstood concept). A bigger concern would be whether Smith's usual wisecracking attitude can mesh with "serious" sci-fi, a la Minority Report. Early signs weren't good (the awkward gay jokes... not funny) but later clips that focused more on the action and less on humor presented the film in a much better light and contained a couple of genuinely creepy moments. 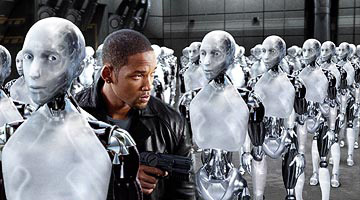 Posited in a future with robots a fundamental and visible aspect of society, it hints at an all-out revolt, with only Smith able to stop it, of course. I think the action is going to be more of the attraction than the ideas behind it, but then, what else is new? With the star power of Smith, some decent but not spectacular effects and effective action sequences, this film is looking to be a medium sized hit, opening in the neighborhood of $48 million, or in Smith's heyday, what would have passed for a record-breaker. So all these Hilary Duff/Lindsay Lohan/Mandy Moore films are, in fact, the same movie, right? I'd swear they're just digitally pasting new heads on the leads and catering to the specific audience for that actress in a Coke/Pepsi kind of deal. A Cinderella Story purports to be a different entity than the jillion other teenage girl wish-fulfillment films that have exploded onto the scene in the last few years. OK, so originality isn't exactly Hollywood's strong suit, but at some point saturation has to kick in. It could happen at any time now as far as I'm concerned. Right in the title we know what we're in for; it's another "modernization" of Cinderella, which by my count, makes it approximately 23,492 versions now. Separated from the clutch of Disney and the branding of the Lizzie Maguire franchise, we will see how much of an audience she really will maintain. The $17 million opening of the Lizzie Maguire Movie seems pretty optimistic at this point and I think we'll see something more like $10 million. Spider-Man 2 remains a force in the box office despite falling nearly 50% in its second week; it will easily stick around for second place and pass the $300 million mark. It's going to need a little help, though, to tie the recently-set fastest to $300 million record of 18 days. It goes into the weekend with around $280 million and the crucial day being Saturday. While the film is hailed almost universally as superior to the first outing of the web-slinger, that praise doesn't seem to have translated into heaps of repeat business as movie goers move on to the next shiny thing. Not that there's any reason to complain about how much it's done so far and is likely to do. An "impressive for third weekend of a sequel" figure of $26 million is likely to result here. Semi-parody comedies are developing into a minor story of the summer, with Dodgeball inching past the $100 million mark during this week and Anchorman looking to follow sometime in the next month. Films like this one are cheap to make, and occasionally catch lightning in a bottle (see: Austin Powers), but the bad ones are quickly forgotten (they must be, or how else would Ben Stiller get to still show his face on a movie set?). Dodgeball is basically finished with its run, but Anchorman has almost exactly slotted itself into the vacant spot left as the former film leaves theaters. Every comedian who was ever on a sketch show will want their own movie now and it's all these films' fault. King Arthur looks to be one of Jerry Bruckheimer's few misses on an otherwise stellar career as a producer. Opening to just $15 million, the Dark Ages action film failed to capture much in the way of imagination and ended up as a rather generic entry in the swords and 'splosions revival since the release of Gladiator. At least Pirates of the Caribbean 2 is coming up.